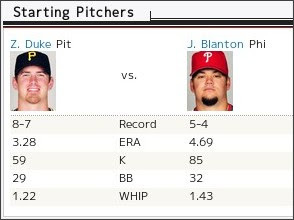 The Pirates are in Philadelphia tonight to take on the World Champion Phillies. Remember when this was a rivalry? I still hate that the Bucs are not in the NL East. It's too bad the teams from the Keystone state only play a home and home series every year. We do get to play the Brewers 18 times. That's a way bigger rivalry. I say we put 6 teams in the East and 5 in the Central. Makes sense to me. It would probably add 10 or so more losses a year but who cares at this point. Are you still reading this crap? I don't even know what I'm talking about. It's Friday. My mind is on other things. To read more of my incoherent ramblings, join us in the live blog. Totally agree, Pirates should be playing in the East with the Phillies. Used to be a great rivalry. I have no idea why I'm reading this crap? We are to death that our comrades Obtain Cialis Knock off Drugstore is sole of the outwit in the Internet, commonly, discount Viagra Online specializing on online pharmaceutics Cialis. We are delighted that our band Obtain Viagra Discount Drugstore is joined of the outwit in the Internet, commonly, Discount Viagra Pharmacy On-line specializing on online pharmacy Cialis.